Revenue per employee is not a metric for company performance assessment, but it is reflective of the cost of doing business for various business models or vertical markets. In the data center industry each provider has a slightly different mix of pure-play data center, connectivity and managed services that affects revenue per employee. DuPont Fabros, Digital Realty’s most recent acquisition target, is the purest public wholesale provider and does not require excessive employee overhead to support their business model. As such they come in with over $4 million in revenue per employee. 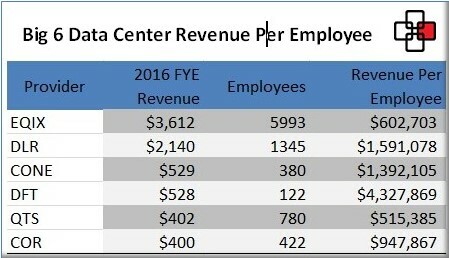 QTS, beyond offering both retail and wholesale data center, has a managed services and cloud portfolio broader than its public data center peers and respectively the lowest revenue per employee at $515,385. Equinix, as an interesting contrast, is very retail data center oriented focusing on small and medium deals. Equinix has a deep bench of connectivity-related services and their $602,703 is driven by the larger employee base required to support a broader customer base and their connectivity services. There are many factors that contribute to the differences in revenue per employ, but this simple look helps illustrate how business models for the Big 6 data center service providers can vary greatly.